On the heels of my recommended DC Comics reading, here’s a list of my recommended Marvel comics. I’ll admit my Marvel recommendations will be light on certain stuff (crossovers and mutants particularly). Again, I favor trade paperbacks versus single issues/expensive hardcovers as much as possible. Essential Spider-Man. Black-and-white reprints of Spidey’s Silver Age and Bronze Age stories. Ultimate Comics: Spider-Man/Miles Morales: The Ultimate Spider-Man/Spider-Man (2016 series). Featuring the adventures of Miles Morales as Spider-Man. It’s the only Ultimate universe book I liked. Storm. Among other appearances, Storm had her own series from 2014-2015. Essential Fantastic Four. Black-and-white reprints of the earliest Fantastic Four stories. Essential Marvel Two-in-One. Black-and-white reprints of the Thing‘s own team-up series that ran from 1974 to 1983. Ms. Marvel. Kamala Khan‘s series, which has seen critical acclaim (and is a plus for diversity), is available in trade paperbacks. Squirrel Girl. 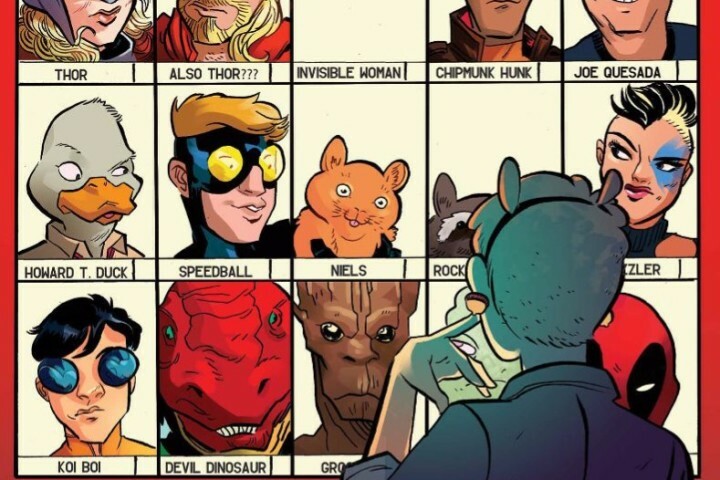 Squirrel Girl’s solo ongoing series, “The Unbeatable Squirrel Girl,” has been collected in trade paperbacks. Howard the Duck (2015 series). Howard’s most recent series is available in trade paperbacks. Moon Girl and Devil Dinosaur. The adventures of the world’s smartest person (a grade-school African-American girl) and her pet Tyrannosaurus rex. Black Panther (2016 series). This Black Panther series, written by Ta-Nehishi Coates, has received much praise. Patsy Walker, AKA Hellcat. The adventures of a Golden Age Marvel character who’s been a superhero since the 70s. Also appearing are her roommate, Ian; Ian’s boyfriend (one of Patsy’s supporting characters from her Golden/Silver Age run); and friends (Jubilee, She-Hulk, etc.). Invincible Iron Man. The newest person to don the Iron Man armor’s an African-American teen from Chicago named Riri Williams. Mighty Thor (2015 series). Jane Foster becomes the wielder of Mjolnir and the newest Thor. All of the above plus other series (including the X-Men and Avengers books) are available on Marvel Unlimited, Marvel’s Netflix-like subscription comic service. I subscribe to Marvel Unlimited; it makes reading their books more affordable to follow.